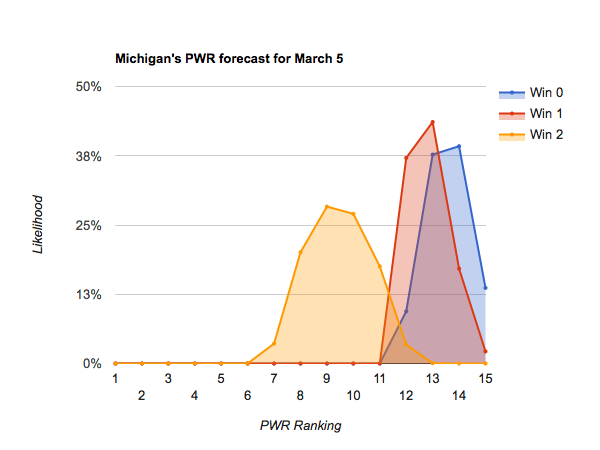 Everyone’s favorite college hockey ranking scheme, KRACH, is also a favorite way to predict the odds of each team winning a game. As in past years, I used KRACH to predict each tournament team’s odds of winning it’s first round game, advancing out of the regional, winning a semifinal game, and winning the national championship. For the first time in modern NCAA tournament history (the modern bracket came into existence when the field was expanded to 16 in 2003), all four 4-seeds are conference tournament champs who otherwise wouldn’t have been selected at-large. That results in a very balanced bracket, minimizing “regions of death” for the top seeds. KRACH gives all the 1-seeds a 70-85% chance of winning their opening round game. In fact, it further gives all four an 11-20% chance of taking the national championship. Cumulatively, straight KRACH probabilities result in a 63% chance of the tournament being won by a 1-seed, but only a 3.5% chance of it being won by a 4-seed. The 2-3 seeds also have similar outlooks with most having a 2-3% chance of winning the national championship. The only exceptions are that slightly stronger performance out of the West this year gives 2-seed Minnesota St a 6% chance of taking the national championship, and 2-seed Denver almost a 10% chance. This entry was posted in KRACH on March 21, 2018 by jim. I’ve crunched through the remaining 192 possible outcomes, and here’s what I think happens tomorrow for each team. So at least two conferences will be won by a team that takes an autobid, leaving at most 3 at-large spots. Two additional conferences can be won by teams that wouldn’t otherwise make it, which would leave just a single spot. The following analysis of what each team needs is much more of a pencil and paper exercise than the automated forecasts, so please point out any inconsistencies or inaccuracies. If neither Boston University nor Princeton win, then there will be three slots remaining. Minnesota and Minnesota Duluth each get one and North Dakota and Boston College will be vying for the final slot. UND gets it with a win or a tie; with a loss, UND can still claim it if Michigan Tech wins. If just one of Boston University or Princeton win, there will be two spots remaining and Minnesota and Minnesota Duluth will get them and North Dakota and Boston College will be left out. If both of Boston University and Princeton win, there will only be slot remaining. Again, North Dakota and Boston College will be out, but only one of Minnesota or Minnesota Duluth will be selected. To get the upper hand, Minnesota needs UND and any of SCSU, NMU, OSU, or RMU to win. This entry was posted in forecasts on March 17, 2018 by jim. How many teams will each conference send to the NCAAs? No teams from Atlantic Hockey will make the tournament at-large, so only the winner of the conference tournament will make the NCAAs. That will be either #20 Mercyhurst, #43 Robert Morris, #30 Air Force, or #34 Canisius. Notre Dame, Ohio State, and Michigan are guaranteed to make the NCAAs. The Big Ten’s representation won’t be increased by the conference tournament’s winner, as the winner will be one of Notre Dame or Ohio State. Penn State and Minnesota are both idle and both stand a pretty good chance of making the NCAAs (in 98% and 76% of scenarios, respectively). 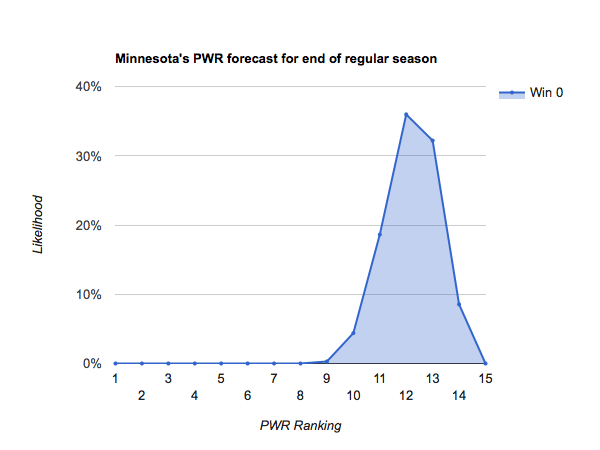 Because both are idle, there is significant overlap between Penn State and Minnesota making the tournament (both need conference tournaments won by high PWR teams to move the cutline and poor performance by other teams in search of an at-large bid, such as North Dakota). Because of that, The Big Ten puts all 5 possible teams in the NCAAs in 75% of remaining scenarios. Only #3 Cornell is guaranteed a tournament appearance, but it’s very unlikely they will be the ECAC’s only representative. Clarkson is guaranteed an appearance with just one win, and makes the tournament in 73% of scenarios in which they don’t win at all. Princeton and Harvard can each make the NCAAs by winning the ECAC tournament, but only by winning the ECAC tournament, so both can’t make it. So, it’s possible, but very unlikely, for Cornell to win the conference tournament and be the only ECAC team to advance. If Clarkson wins the conference tournament, both Cornell and Clarkson will go to the NCAAs. If either of the other two win, the ECAC will have three representatives if Clarkson makes it at-large or two if not. Providence and Northeastern are guaranteed to make the NCAAs. If either Boston University or Boston College win the Hockey East tournament, that winner will also advance, giving Hockey East three teams. There are also a very small number of scenarios in which BC or BU make the NCAAs despite Providence or Northeastern advancing (generally having to do with favorable cutlines and some quirky RPI luck; see How Boston University can make the NCAAs without winning Hockey East for more details). St Cloud St and Denver are guaranteed bids. While one might guess that #8 Duluth is a lock, especially knowing that #9 Providence and #10 Michigan are, reader of CollegeHockeyRanked – NCAA tournament possibilities know that Duluth misses in about 11% of scenarios in which they lose the semifinal. 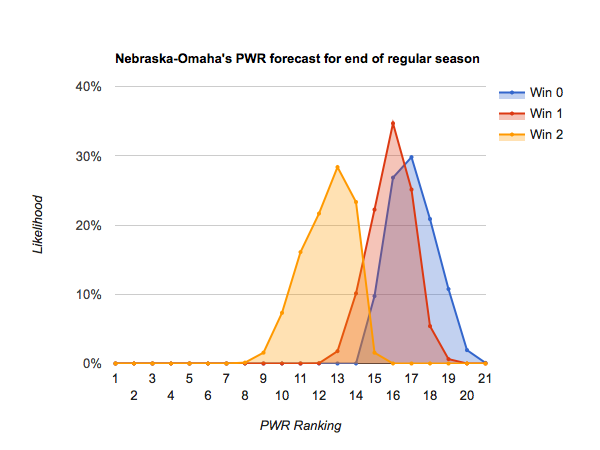 So, the NCHC advances only 2 teams in about 2% of possible scenarios, or 3 teams in about 60%. North Dakota also stands some chance of advancing, either by winning the NCHC tournament (25% of possible scenarios) or at-large. Minnesota State is guaranteed a bid. But, Minnesota State has already been eliminated from the WCHA tournament. Neither of the remaining two teams–Northern Michigan and Michigan Tech–can make the NCAAs at-large. So, the winner is guaranteed to be the WCHAs second team in the NCAAs. This entry was posted in forecasts on March 14, 2018 by jim. One mandatory outcome for the Terriers to advance without winning the conference tournament seems to be North Dakota losing two games. Any win or tie by the Hawks, even if it doesn’t result in UND getting a bid, eliminates any chance of BU getting an at-large bid. Beyond that, it takes one of a few particular combinations of outcomes to land BU at #14. There are 41 such combinations in the 12,288 possible outcomes in which Boston University wins the opening game versus Boston College but loses the Hockey East championship. Even if Boston University gets to #14 in the PWR, as described above, only two conference tournaments can be won by teams ranked #15 or lower for the #14 team to get an at-large bid. Because the WCHA (#17 Northern Michigan vs #24 Michigan Tech) and Atlantic Hockey (#20 Mercyhurst, #43 Robert Morris, #30 Air Force, and #34 Canisius) can only be won by teams that will finish #14 or lower, all other conference tournaments must be won by teams that finish in the top 14. That’s guaranteed in the Big Ten, where only #2 Notre Dame and #4 Ohio State are vying for the championship. Also in a Hockey East tournament in which BU doesn’t win, a winner from among #15 Boston College, #9 Providence, and #7 Northeastern is guaranteed to be in the top 14. So, from the ECAC, #3 Cornell or #11 Clarkson must take the championship rather than #22 Princeton or #26 Harvard. And, in the NCHC, #1 St Cloud St, #5 Denver, or #8 Minnesota Duluth must win (though #14 North Dakota losing is already a mandatory condition to get BU to #14, as stated above). To get to #14 but not win the Hockey East championship, Boston University needs to win vs. Boston College but lose the championship game. The Terriers also need some help from North Dakota, which must lose in both the semifinal and consolation games. Also, for the #14 team to advance to the NCAA tournament, the above must hold and Cornell or Clarkson must win the ECAC tournament. Those conditions leave 1024 remaining possible scenarios, in which 41 of them see BU hold onto the #14 slot and get an NCAA bid. This entry was posted in forecasts and tagged Boston University on March 13, 2018 by jim. Because of a new conference tournament schedule this year, there are only 15 games remaining and thus only 49,152 possible outcomes remaining (the NCHC consolation game can end in a tie). That’s a dramatic simplification from past years, and there are thus few surprises in the possible outcomes. 16 teams make the tournament. The winner of each conference tournament is selected with what I sometimes call an “autobid”, then the remaining slots are filled in order of final PWR rank. Thus, teams that don’t make the tournament with an autobid but end up in “bubble” PWR ranks of 12-15 want conference tournaments won by high ranking teams so there are still slots available for them to get selected at-large. Teams that can’t finish in the top 16 of PWR can only be selected for the NCAA tournament by winning their conference tournaments and getting an autobid. 9 teams are guaranteed to make the NCAA tournament regardless of outcome next weekend. Minnesota-Duluth and Clarkson both stand a good chance to make the NCAA tournament regardless of outcome (in 89% of scenarios in which they go 0-2 for Duluth and 73% of scenarios in which they lose for Clarkson), but can lock up at-large bids with a single win. If either should lose, they just need enough of the teams above to advance to leave at-large spots available for them. Much like Duluth and Clarkson, these teams hoping for an at-large bid want conference tournaments to be won by teams that have already locked up a bid (above). If a team that wouldn’t otherwise make the tournament wins a conference tournament and gains an autobid, that would leave one fewer at-large slot for these teams. 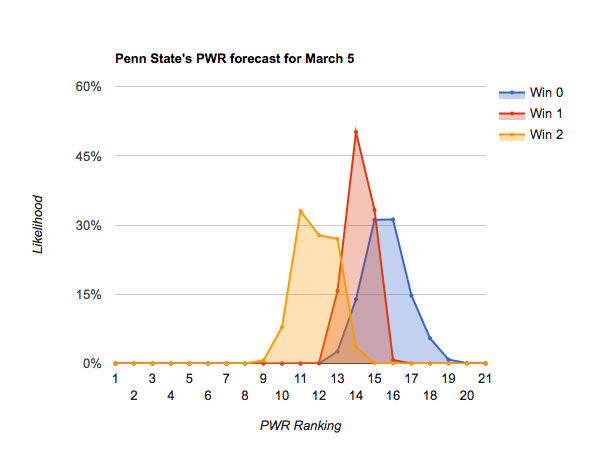 Penn State is quite likely to advance, in 98% of remaining scenarios. 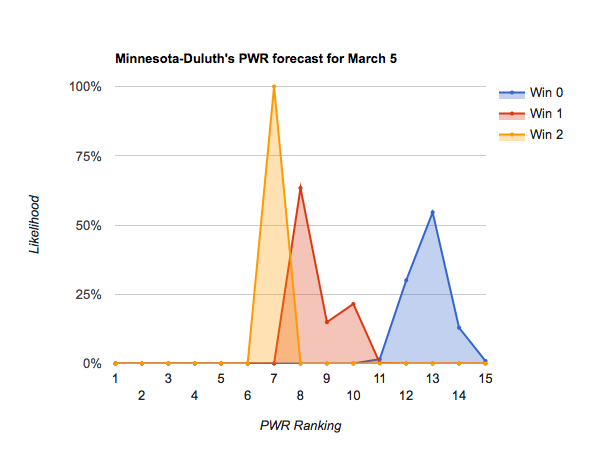 Minnesota faces a more perilous 76% of scenarios remaining that allow the Gophers to advance. 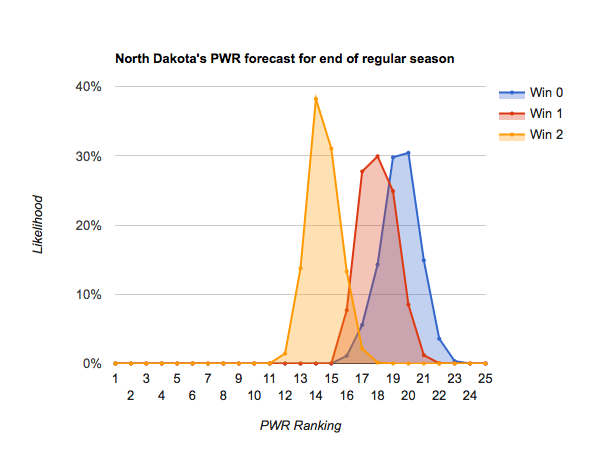 North Dakota gets selected in 14% of scenarios in which they’re winless, 25% of scenarios in which they win 1, and can get an autobid. Boston College faces less favorable 3% and 9% chances with zero or one wins. Boston University can’t make it without a win, and even with 1 win faces a tiny chance of being selected at-large (under 1% of scenarios in which they win just 1 game). 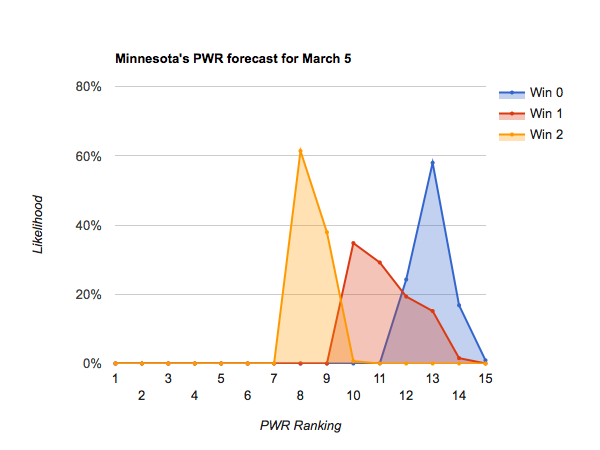 This entry was posted in forecasts on March 12, 2018 by jim. 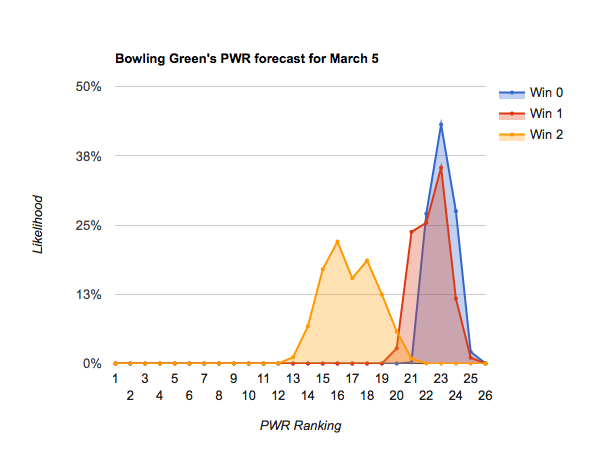 Now that we’re in conference tournament play, note that the forecast is for one week. It would take highly unlikely (though not mathematically impossible!) bad luck for any of the current top 6 to miss the NCAA tournament. #1 St Cloud through #6 Denver should emerge from the weekend in the top 8, even if they fail to advance. It would be exceedingly unlikely for any of them to then fall to #12 or below while idle AND have conference tournaments won by enough low ranked teams that teams in the #12 range fail to make the NCAA tournament at-large. A similar case can be made for #7 Michigan, who should fall between #7-#12 if they lose. 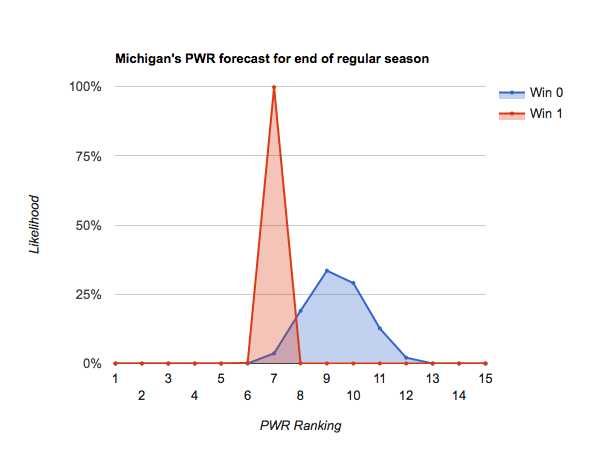 But, it’s just possible enough to hit #12 (or below) and miss that I don’t yet dare call the Wolverines a lock. #8 Clarkson through #12 Providence can drop to the bubble with loss(es), or position themselves well with win(s). None of these teams would be outright eliminated if they fail to advance this weekend, but would become dependent on others’ performances and some luck. #13 Minnesota has already been eliminated from the Big Ten tournament, so is not playing this weekend, and is likely to emerge from the weekend between #10-14. Nothing is likely to change for the Gophers this weekend–they’re not yet eliminated, but will be dependent on others’ performances and some luck. 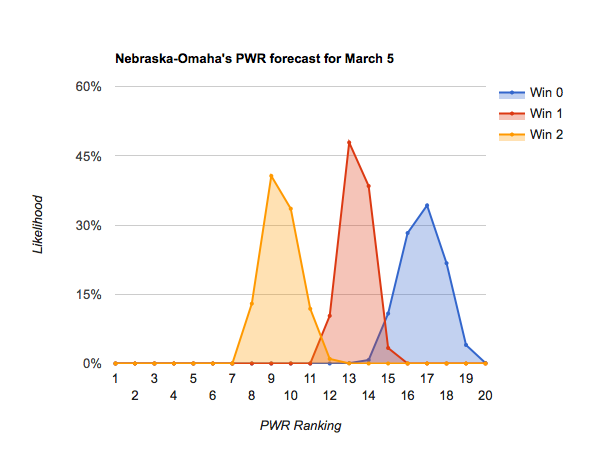 It’s tough to imagine #14 Nebraska-Omaha or below making the NCAA tournament unless they advance this weekend. The Mavericks show some chance of emerging #15, with a slim remaining chance of an at-large bid, from a winless weekend; but even that hope doesn’t seem to extend to #15 North Dakota and below. 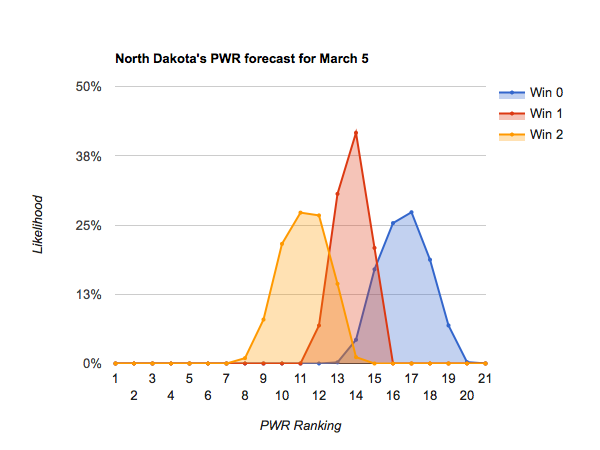 This entry was posted in forecasts on March 9, 2018 by jim. With all conferences except the NCHC in the opening round of conference playoffs, many teams have the weekend off while others play in a best-of-3 play-in series. #1 St Cloud St isn’t going anywhere. Even though the Huskies play a pair of games, #2 Notre Dame and #3 Cornell are idle so can’t do enough to overtake St Cloud. They’re also both nearly guaranteed to stay in the top 4. #4 Minnesota St, #5 Denver, and #6 Ohio St are all playing and all vying to fill spots 4-6. Idle teams #7 Clarkson, #11 Northeastern, and #12 Providence should all stay at 13 or above. #8 Minnesota-Duluth, #9 Minnesota, and #10 Michigan can stay top 10 with a pair of wins (though even with a pair of wins Michigan could stumble out of the top 10, most likely in the condition that they also get a loss in the best of 3 series). #13 Penn State, #14 North Dakota, ad #15 Nebraska-Omaha all have the potential to climb into the single digits with a pair of wins, or fall to 16 or below with no wins on the weekend. Of other teams, only #17 Northern Michigan and #18 Bowling Green stand a significant chance of climbing to 13 with a pair of wins. 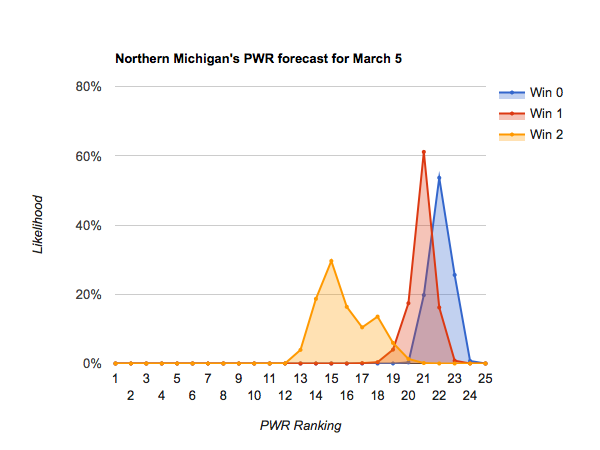 This entry was posted in forecasts on March 1, 2018 by jim.